As more and more consumers shift to social channels as a communication tool, intelligent chatbot applications present a real opportunity for companies to transform the customer experience and engagement process. Traditional customer service—limited to standard business hours and known for long waiting times—no longer meet the requirements of consumers or companies. Today’s users expect to be able to access personalized services, tailored offers and timely suggestions based on their preferences and current context, whenever they need it and from any device. Chabot applications based on artificial intelligence allow users to interact directly with your business using their own words, through natural, human-like conversations. Chatbots automatically provide content, facilitate a purchase and help connect customers to the right information 24×7, with rapid and consistent responses. The ability to understand the customer in their own words and how they describe their problem or issue enables targeted responses based on a specific customer’s needs. Cogito Chatbots never put users on hold. 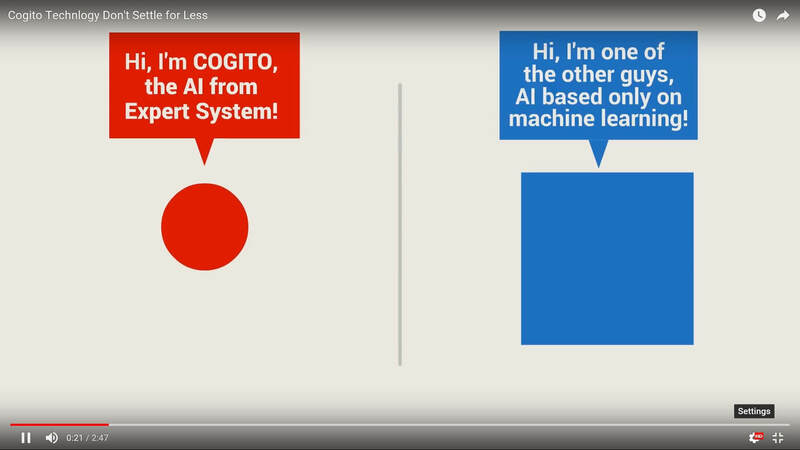 Expert System’s Cogito applies artificial intelligence, semantic analysis and natural language processing to provide a personalized and streamlined customer service experience that is always available. Through an immediate and deep understanding of what customers say and how they say it, Cogito chatbots significantly improve the customer experience, providing new and effective ways to retrieve useful information in a conversational, human-like style. Customers are not forced to operate multiple sequences to complete simple tasks, and the chatbot is smart enough to hand a conversation over to live human assistance, if necessary. Chatbot applications based on Cogito also improve the efficiency of your customer support activities while reducing operational costs. Chatbots eliminate expensive interactions typical of traditional call centers while providing engaging and personalized one-to-one assistance. Chatbots automatically manage recurring activities and frequently answered questions and can respond to questions without human intervention. This allows operators to focus on greater value-added activities where human support is necessary and available to engage in the assistance process for more complex queries. A deep comprehension of the meaning of words offers a great opportunity for extracting strategic information from the conversations with customers. Detailed preferences, comments, habits, feelings, needs, etc. can be identified, tracked and transformed into actionable intelligence to identify not only trends, problems and signals but also customized requirements. In turn, the detailed customer information that is collected and analyzed can be used to enrich enterprise CRM profiles. Chatbots meet the needs of both companies and customers, improving efficiency, reducing costs and providing customized assistance. With Cogito, access to seamless and personalized customer support has never been easier or more immediate. Because Cogito reads the way that people do, the same capability allows you to treat customers on a profile basis, and streamlines the overall customer interaction process.